As a side effect of drawing this strip, I have a craving for unagi. I've always seen Todd as someone who is vegetarian because he doesn't care very strongly about the taste of meat, versus the more political/social reasons. Todd’s face to me is the best part of this strip. When I saw that I couldn’t help but laugh till my stomach hurt. His eyebrows were so frightened, they sought asylum in his hair. You would think it would be on Tumblr or Twitter since that’s all the rage nowadays. Let’s not forget, though. It was stated earlier that this comic is still loosely set in 2010. I can’t imagine any of my friends not on facebook at that particular time. Best punchline yet. And totally what a kid her age would do to get a reaction from the adults. Love the creepy face in panel 5! Creepy? I thought she looked adorable. Craving for unagi, why not? It’s good for what eels ya. Well at least you got to use the “Worst. Vegetarian. Ever.” line. Chop ’em into rounds, boil ’em in water and vinegar till the gelatin smears, and (for Todd, not Selkie) add lemon juice or cider vinegar when it cools and solidifies. I’m in London soon, and I know what I’ll be eating! I laughed so hard I nearly woke my hubby up! Love that last panel. Yeah, that was a pretty funny moment, but am I the only one who thinks it’s a bad idea to draw attention to her by putting pictures of her up on the internet? Selkie is not ‘secret’, just not very common. The government is not hunting her nor are labs looking to dissect her. 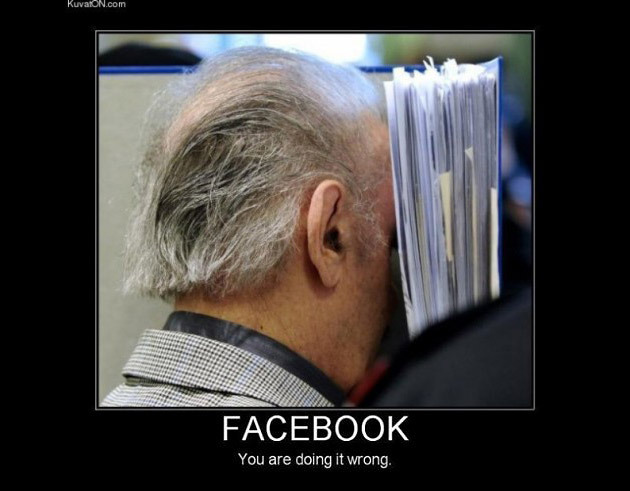 Best way and worst way to ‘normalize’ her being different is to go about day to day things like face booking. Worst that can happen is face book drama/bully/stalker crap, best thing is others realizing they can relate to her. I’m more concerned about it from a publicity standpoint. What do you think would happen if it went viral and millions of people saw the video? Even if the government didn’t want to hunt her down she would still probebly have to deal with news crews and a hoard of 100+ people who want to meet and talk to her. That assumes that Selkie’s race is a huge secret from the world. People are startled by Selkie’s appearance, but not outright shocked. They don’t say “What is she?” and seem to take her dietary requirements in stride. Heather’s mom didn’t react negatively to the knowledge that Selkie could only eat meat. She was more worried about committing a faux pas by serving something a guest could not eat. There’s a handy feature on Facebook that can make photos only able to be viewed to who you wish. I thought the picture was taken of Todd and his sister, their reactions, not Selkie. I was concerned about that too. But Todd walks around town with her without taking any precautions at all. Most people just think she has some kind of illness. Err… can I get Antoine’s fb name to send him a friend request? It’s possible that Antoine’s camera is only pointed at Todd and his sister, for anyone worried about Selkie stalkers. Selkie’s expression of simple innocent joy in panel five makes up for much previous sadness. But it’s not just the smile, it’s the fact that she is clearly far too wet to get back into the car. That’s what I said. I just phrased it a trifle more tactfully. May I use Todd’s face for a Gravatar again? I read so many different webcomics, and this one alone is the one that can always bring a smile to my face no matter what. Oh, man, I hope Todd has a current fishing license! And even then, IIRC eels are under strict catch limits in all states where they can be found. Also, my husband thinks Selkie is creepy, but I think she’s utterly adorable. My wife thinks she is creepy too! I told her that she is heartless for thinking this. I dunno what the rules are in Wisconsin, but around here if you are under sixteen or an aborigine you don’t need a license to fish. Also, I suspect that that clean water act Grampa alluded to includes a tiny clause buried in all the legalese about about the Selkie-kin being permitted to fish. That’s the state department’s general assumption, at any rate. The document is so complex that all the lawyers who drafted it went insane. I think one of them now heads the Cthulhu cult down in Louisiana. Yum. Unagi is delicious. Now I want some too. Can’t convince my husband to eat it though. Actually, I can’t convince him it’s fish. He says eels are too ugly to be fish, lol. Same reason my mom had us be vegetarians until I was almost 10! Now I’m going to go get me some unagi nigiri… that sounds fantastic. Why are they freaking out over a couple of eels? Is it just the Surprise! In your Face! thing? Or is it something about eels, in particular? I wonder who is more scared? My money’s on the eels, seeing as they’re being held by a predator and all. Have you ever met an eel? They’re incredibly ugly and vicious looking, and in this case would be thrashing around violently. This is in addition to having them thrust violently into their faces. I’d be screaming, too! Yeehaw! Love her grin. Days like this get remembered! Not only does she get to freak out Dad, she’s got a really cool Uncle who takes it all in stride. Given how they are sitting on the river bank with their feet in the water, Marta’s “diving for cover” means she’ll be all wet in thursday’s strip. Wouldn’t it be fun if SHE came up for air with a fish in her hand? Er, isn’t that one new link a tad NSFW? Oops- meant my following comment in reply. Thick finger syndrome. No harm done my end- I’m at home today. I saw a BBC production of Richard III recently that had a “U Certificate- suitable for all” rating. There was a beheading, fer cryin’ out loud! Makes you wonder about the criteria used. Also if you notice a lot of PG or other low rating shows have a lot of sexual activities. Two and a half men, Cougar Town, Hot in Cleveland, Family Guy, Futurama etc. And they are allowing kids of all ages to view, its no wonder our youth is getting more sexually active. ……hmmmmmmm -gets pan and knife- ok kid well cook it! panel 2 – is Marta not wearing her engagement ring? I only mention panel 2 because given her hand positions in all the other panels, #2 is the only one the ring would be obvious in. I do remember it's a cute little one. But all of the siblings’ faces – scared Todd/Marta and smug Antoine – are all pure and unadulterated glory. As is wet-haired Selkie. I love your characters very realistic! Eels! I would not have thought of that ever. Great comic. I usually just lurk, but the last panel literally had me choking on my water. I love their expressions! Antoine and his niece make quite the team! I foresee further hijinks at others’ expense in the future; poor Todd. Love the expressions on the eels: Make her let GOOO!! I love the “wacky uncle” vibe Anthony has going for him right now. Great comic, By the way! I’m a new reader, and I’m totally loving it! I expected marta to fill that roll. Who’s to say that role is only filled by one person? I once had to deal with an eel. They do not die. This sucker was out of the water for hours, had his brains bashed in, his guts and heart taken out and was still thrashing as we skinned it. Turns out that the heart keeps beating for approximately 2 hours (at slower and slower rates) after it is removed from the body. If you do not break the neck near the head it will continue thrashing long after it is dead. This makes it difficult to skin. Now imagine doing all of this dressed as a 17th Century housewife and explaining it to the hordes of public coming to see your exhibit. I had to keep calm and act like it was normal while inside I was screaming and totally freaked out. My “little brother” was 10 and as he had caught the beastie that morning he kept running back to see if the heart was still beating. I will admit that once we got it cooked up it was delicious. Well, it’s official: Antoine is my Uncle Dale, at least where pranks are concerned. This makes him officially awesome. I love this arc. It’s nice to see a fun, happy family moment, especially after all the character-building angst from the previous one. And now for sushi. Her failure weighed so heavily upon her, she felt a bit… eel. Here in the Netherlands we eat them. 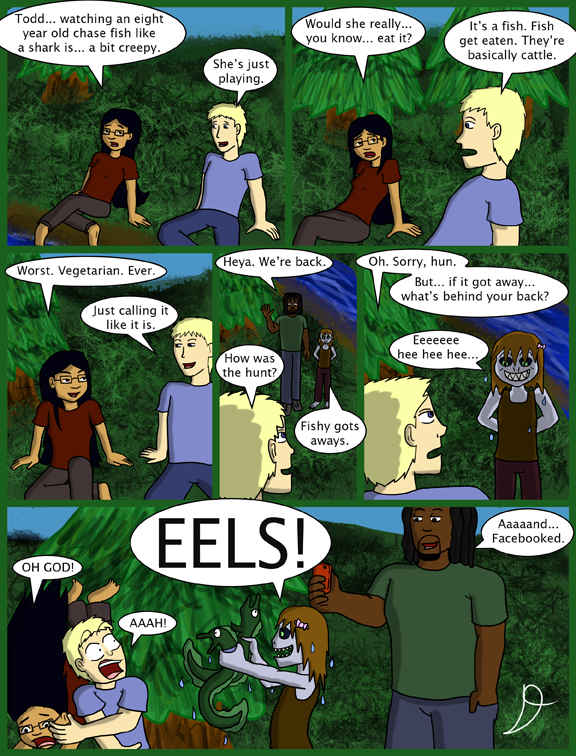 This is one of my favorite pages, between “EELS!” and the fact you are so tremendously gifted at drawing forests.